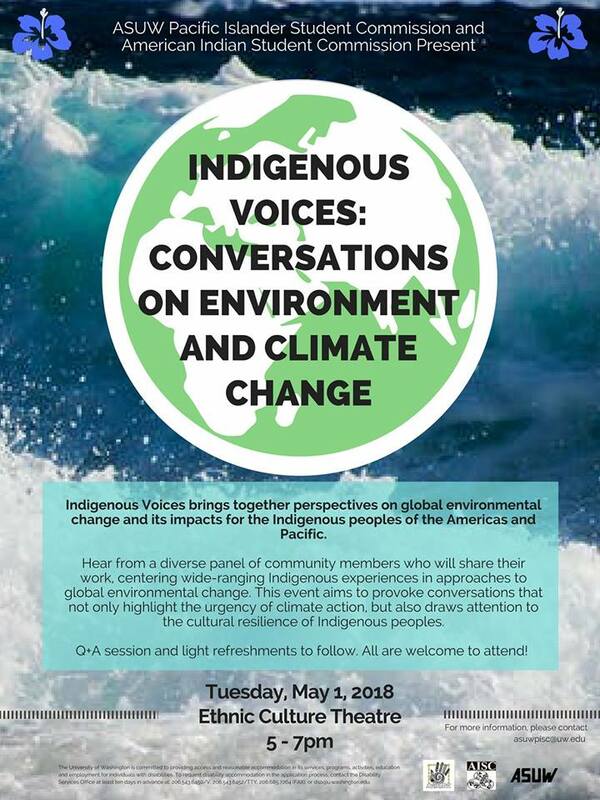 Tuesday, May 1, 2018, 5 – 7 p.m.
Indigenous Voices brings together perspectives on global environmental change and its impacts for the Indigenous peoples of the Americas and Pacific. Hear from a diverse panel of community members who will present and share their work, centering wide-ranging Indigenous experiences in approaches to global environmental change. This event aims to provoke conversations that not only highlight the urgency of climate action but also draws attention to the cultural resilience of Indigenous peoples. Photos may be taken at this event to be used by the ASUW. If you do not wish to be photographed, please notify the Pacific Islander Student Commission or the American Indian Student Commission at asuwpisc@uw.edu or asuwaisc@uw.edu.